A message in a bottle is a form of communication whereby a message is sealed in a container (archetypically a glass bottle, but could be any medium, so long as it floats and remains waterproof) and released into the sea or ocean. Such messages are not intended for a specific person, but to end up wherever the currents carry them. Because of their simplicity they are often associated with people stranded on a deserted island, attempting to be rescued. However, many people release such messages for pleasure, to see how far their message can travel and to make new friends. They are also used for scientific studies of ocean currents. 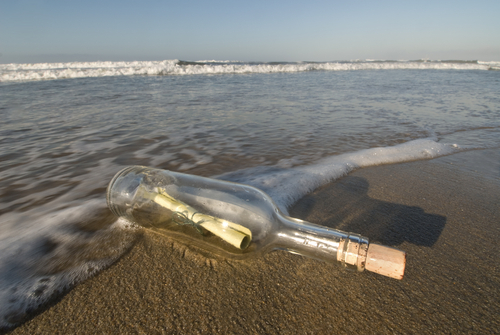 The phrase “message in a bottle” has also come to refer to any message sent without an intended destination. Yes the Abarat-books are nice 🙂 I made the avatar by copying and cutting out Malingo, and adding him to a tiny part of the “Abarat world map”. By the way… I also made an pretty nice “abarat wall clock” for my friend. I’ll see if i can find a photo of it and add it to this blog.